I am a photographer and for many years I worked in London, later Zurich for 10 years and I’m now located back in England in the South West. My work has been published in lots of printed media. In 2018, I have had my photos printed in the Daily Express, Western Moring Mews (and thier and other news websites). 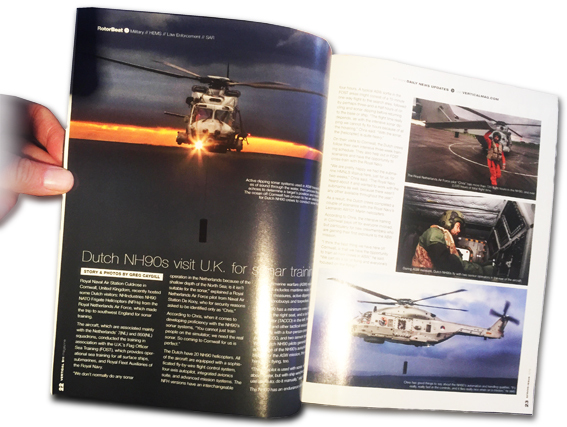 Also a few stories, written and photos printed in Vertical 911, magazine and others, including Fly Navy. In 2016, I’ve had photos in the Sun, New Day (Front page) Daily Mail and other regional papers, as well as my Aviation work. All photos are copyright to me unless stated, but please note some I have taken for clients. Some of the photos are for the use of the Royal Navy Air Squadrons or RAF are not for sale. They are clearly marked, and are for their use only, and are here just as an example of the photos. All Royal Navy, RAF OR Army Helicopters are FREE for the people in the photos or their squadrons for their personal or MOD use when asked for with pleasure. But most aviation photos are available at a small cost if anyone wants to contact me. Other work has been published in lots of printed media; the Sun, New Day (Front page) Daily Mail and other regional papers, Air Forces Monthly, Estates Gazette, numerous property including front pages, Western Morning News, Exmouth Journal (Concorde landing), Plymouth Herald and Bristol, Newquay Voice, Swiss Mailing, Mountain photography, Advertising including studio sets. and many, over 40 websites including Exmouth town guide, Exeter Airport, Cadgwith Gig Club and numerous Hotels. Also Bands, including Wilko Johnson, Swiss Music CDs. Flyers and posters. On this website you can view my wide portfolio of images, hopfully learn a little more about me. Contact me if you would like to buy high quality canvases and prints. For example an A4 high quality gloss or matt print on real photo paper will cost £5 plus postage. All images contained within this site are the express copyright of the author, they may not be used without permission. Please contact me to inquire about the use of my images. Thank you for looking. Ps. You may comment on the bottom of the pages if you wish.